Available for the first time at Crick Boat show, the Panda 4000s Neo and the Panda 5000i Neo are the latest additions to diesel generator expert Fischer Panda’s range of compact gensets. 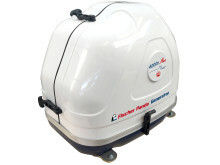 The affordable and easy-to-install Neo generators are the first to use Fischer Panda’s in-house designed water-cooled FPE320 single cylinder diesel engine. 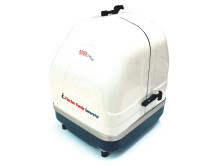 They are ideal for owners of smaller vessels and canal boats with limited space who are looking for independence away from marinas or shore power. Both generators provide 230V/50Hz AC output that ensures a reliable, clean power supply for running household domestic equipment, electric cooking and keeping batteries charged. Featuring the renowned Fischer Panda sound insulation, they run extremely quietly at a noise level of 54db(A) at a distance of 7m. 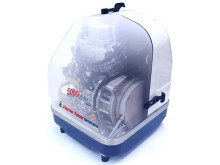 Weighing just 93kg, the 4000s generator measures 550mm (length) x 450 (width) x 518 (height). Launched in April this year to add to Fischer Panda’s ‘entry level’ range, it is the re-design of the longstanding and popular Panda 4000s FC. The 5000i is even lighter at 75kg and measures 456mm (length) x 426 (width) x 526 (height). Like all iSeries Fischer Panda inverter generators featuring variable speed control, the new model is characterised by its high efficiency, quiet operation and compact design. The next generation technology means the speed of the diesel engine is adjusted according to the user’s changing power requirements while the output voltage always remains constant from the PMGI inverter. This not only significantly improves fuel efficiency, but also benefits the environment as the engine is always working correctly loaded thereby operating at its most efficient with reduced wear and emissions in comparison with a traditional generator with fixed speed RPM. The 4000s and 5000i are 'twin circuit cooled' via an integral heat exchanger and treated sealed fresh water circuit, an efficient system featured in the majority of Fischer Panda’s AC gensets. The new FPE320 engine features integrated oil filter and synchronous alternator for even lower running noise levels and reduced vibration. Chris Fower, Marine Sales and Marketing Manager for Fischer Panda, said: “The Panda 4000s Neo and 5000i Neo are extremely compact and offer significant weight and space savings for boat owners looking for freedom away from shore or marina power. Fischer Panda is the leading distributer of mobile, quiet diesel generators and offers the market’s largest selection of marine generators from RIBs up to super yachts. The Panda 4000s Neo has been available since April 2017 at a typical sale price of circa £4,500 + VAT. The Panda 5000i Neo is available now at a typical sale price of circa £5,500 + VAT. The new Panda 4000s Neo and Panda 5000i Neo marine generators will be presented at this year’s Crick Inland Boat Show from May 27th to 29th on Stand WW62/64. 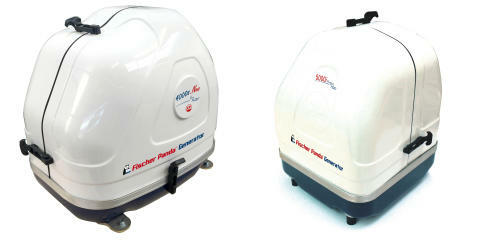 Visit www.fischerpanda.co.uk for more information about Fischer Panda’s range of marine generators and other products. Renowned worldwide as innovative, reliable and extremely quiet, the extensive Fischer Panda range of compact diesel generators includes its next generation highly efficient and powerful variable speed iSeries-Generators. Other world-class products from Fischer Panda UK include desalination systems from Sea Recovery, HRO, and Village Marine, with models suitable for day-boats to warships and offshore platforms, plus air-conditioning systems from leading marine HVAC supplier Dometic. Operating since 1977, Fischer Panda GmbH is headquartered in Paderborn, Germany. The Fischer Panda team covers more than 500 technicians and partners in over 90 countries worldwide and this year is celebrating its 40th anniversary.